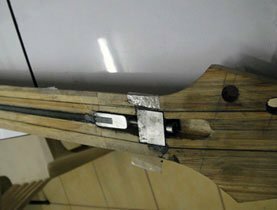 Now, we install our new Carbon-Glass Truss Rod. 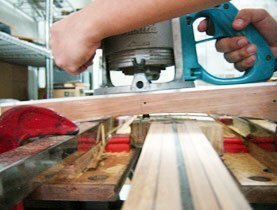 We begin by cutting the truss-rod slot using a router. At the headstock-end of the neck, an aluminum block is embedded for additional strength and rigidity. In all guitars, the weakest point is this area where the neck meets the headstock —a critical breaking point. In addition to improved rigidity and strength, any additional support here will enhance tone and sustain. 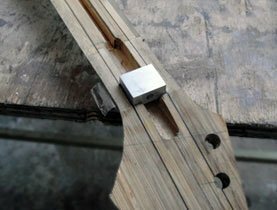 The aluminum block also serves as a foundation that evenly distributes the load of the tensioned truss-rod over a wider surface area. This aluminum block is glued using high grade structural epoxy. The nut sits in direct contact above this block further enhancing sustain. A cavity at the headstock behind the nut is provided with ample space for a hex key wrench to reach into the stainless steel Allen adjustment screw for tightening the truss-rod. Another cavity behind the aluminum block gives the truss-rod head (see Carbon-Glass Truss Rod) some freedom of movement. 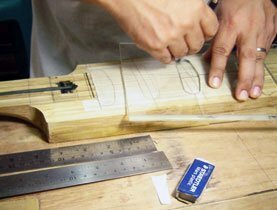 With the cavity routed to specification, we begin installing the truss-rod. 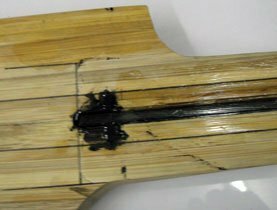 The stainless steel anchor at the body-end of the truss-rod is glued, again with high grade structural epoxy. Finally, to ensure against the possibility of the rod rattling, we add some silicone sealer into the channel. The sealer will dampen any unwanted vibrations that can spoil the sonic quality of the neck. For the body part of the neck-thru section, we will route the pickup cavities, the bridge height adjustment screws, the string ferrules where the strings pass through the body and the tail block —a piece of aluminum at the bottom that terminates the strings and where the ball-ends are anchored with easy access at the back. For this design, we will have 3 single coil (DiMarzio Area 69) pickups. The pickups are body mounted and can be installed from the back of the guitar (how many times have you ever wanted to change pickups without having to loosen or take off the strings?). For that reason, the pickup cavity goes through the entire neck-thru body but not through the entire body (see figure at the right). The body top also has a mild curvature which we will shape using yet another jig. That’s what we will do first. The images below show the jig in action. 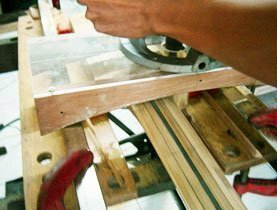 The jig rides on two rails with the router mounted on an acrylic plastic base which is mounted on two wooden sides with the desired curvature. 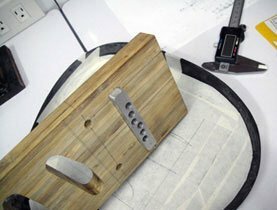 I use this type of jig anytime I need some curvature —works well all the time. 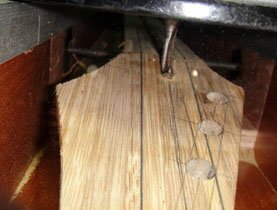 You might be guessing that I use a variation of this jig to shape the fretboard as well, but no, I did not. This guitar design has a compound radius fretboard for which this type of jig is not suitable. More on that later. Now let’s move on to routing the pickup cavities. It starts with proper preparation and layout. I have prepared beforehand acrylic plastic templates for single and double coil pickups for standard Strat and Les Paul style pickups. I cover the entire area with masking tape and draw the outlines first. It was tempting to use the Strat’s pickup positions which give it its distinctive sound, but 1. I use a slightly shorter 644mm scale (25.35″) and 2. I have 24 frets (the Strat has 21). 1 is not a problem —it can be scaled. The real deal breaker is 2. The Strat’s neck pickup sits at around the 24th fret position. Hence, for this design, I compensated a bit and came up with a hybrid Ibanez Jem (I am a proud owner of two of these lovely Jems) and Strat layout. 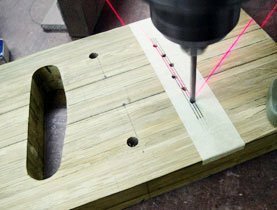 I use the acrylic plastic template to guide the router using a pattern following bit. 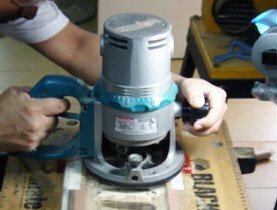 Before routing,I pre-drill the cavities using Forstner bits to minimize the router’s work. Finally, at least for the neck-thru body, we drill the top string ferrules, the bridge height adjustment holes and the aluminum tail block. The bridge height adjustment is also accessed from the bottom. There will be no unsightly screws at the body’s top. Drilling the top string ferrules. I love laser guided drills!